OMEGA Hi-Lok and Hi-Lite Installation Ratchet Assembly includes a 5/64'' Hex Key and a 9/32'' Socket. 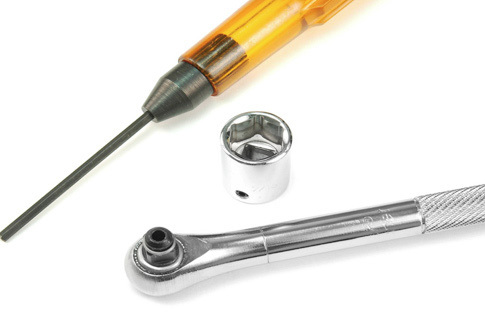 OMEGA Installation Assemblies are hand tool assemblies for the installation of the Hi-Lok or Hi-Lite fastening systems that include a Roller Ratchet wrench with a through hole, a socket, and a plastic handle Allen Wrench. The through hole in the ratchet allows for the insertion of an Allen key. A plastic handle or T Handle Allen Wrench with a replaceable blade is furnished, but any Allen Key style can be used in conjunction with the ratchet. The socket is held to the square drive with a set screw which eliminates FOD. The OMEGA ATRR9 9/32'' x 5/64'' Hi-Lok / Hi-Lite Installation Assembly is one of thousands of quality tooling products available from MRO Tools. Please browse Hi-Lok Assemblies for tools similar to the OMEGA ATRR9 9/32'' x 5/64'' Hi-Lok / Hi-Lite Installation Assembly. OMEGA ATRR9 9/32'' x 5/64'' Hi-Lok / Hi-Lite Installation Assembly description summary: OMEGA Hi-Lok And Hi-Lite Installation Ratchet Assembly includes: 9/32'' Socket, 5/64'' Hex Key. Quantity discounts may be available for the OMEGA ATRR9 9/32'' x 5/64'' Hi-Lok / Hi-Lite Installation Assembly. Please contact MRO Tools for details.